Weft extensions are a wonderful and versatile type of hair extensions that can be added in a short amount of time. Very often we have a special occasion where we need our hair to look extra fabulous but we just don’t have the ability to do some of those styles with our short thin hair or if you are trying to grow out your latest short haircut. This is where Weft Hair Extensions are so great! 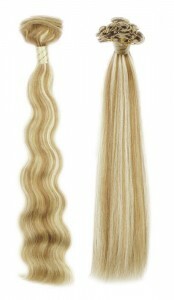 Our Weft Hair Extensions are machine tied hair extensions and are high quality 100% European human hair. They come in lengths from 10″ all the way to 24″ and in dozens of colors and highlighted colors and several wave patterns including straight. They are attached in minutes with a very safe cold fusion liquid. No harsh glues that can cause damage and no tight cylinders that cause breakage. Unlike sewn and hard bond glued extensions, our Weft Hair Extensions are removed with a mild conditioning remover in seconds! Depending on the length of hair and home care habits, our Weft Hair Extensions can be worn for up to 5 weeks before reattachment is needed. Unlike low quality store bought hair from beauty supply stores, our hair can be reused for up to 4 months without tangling or matting! Call today for a consultation and let us show you our gorgeous hair!